The Shakespearean farce, a tale of mistaken identity, has a number of solid performances from the GCU student cast. 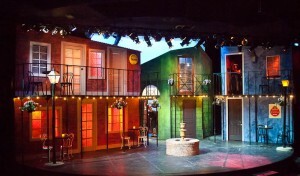 But perhaps the biggest star is the set created by Assistant Dean Bill Symington, technical director Matt Ward and their stagecraft class in the College of Fine Arts and Production. 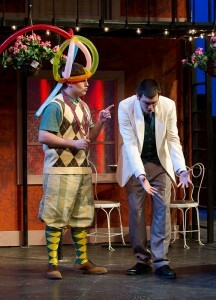 Nathan DeLaet (left) as Dromio of Syracuse and Jake Swanson as Antipholus of Syracuse. The vivid reds, greens and blues of New Orleans’ French Quarter are a visual knockout, bringing the Mardi Gras theme to life. It’s easily the most spectacular set of the Ethington season, right down to the wrought-iron balconies and a small, bubbling fountain at center stage. Under the direction of Valley theatre veteran Joe Flowers, the cast rises to the occasion in the 90-minute play, which opens its six-show run on Friday night. Wednesday night’s dress rehearsal found the players in fine form. “The Comedy of Errors” tells the story of two sets of identical twins who were accidentally separated at birth. Antipholus of Syracuse (Jake Swanson) and his servant, Dromio of Syracuse (Nathan DeLaet), arrive in Ephesus, which turns out to be the home of their twin brothers, Antipholus of Ephesus (Anthony Cotoia) and his servant, Dromio of Ephesus (Keith Wilhelm). Wild mishaps result, based on mistaken identity, when the two from Syracuse encounter the friends and families of their twins. It can get a little confusing at times, so pay careful attention and keep your program handy. The ending is one glorious mess — but a happy one. The stage set for "Comedy of Errors." Because so much of the plot revolves around the two sets of twins, the play depends on the performances of the four actors in those roles. All four come through. DeLaet and Wilhelm are laugh-out-loud daffy as the twin servants, and Swanson and Cotoia provide the right comic pacing for the madness surrounding them. Swanson has had prominent roles in other productions this season, but Cotoia is a newcomer. It’s not easy to break in with Shakespeare, but he does it remarkably well. Other noteworthy performances come from Rachel Maish as Adriana, the thoroughly confused wife of Antipholus of Ephesus; Daron Beck as the merchant Angelo; and Dan Cocca in a small role as the witch doctor Pinch. 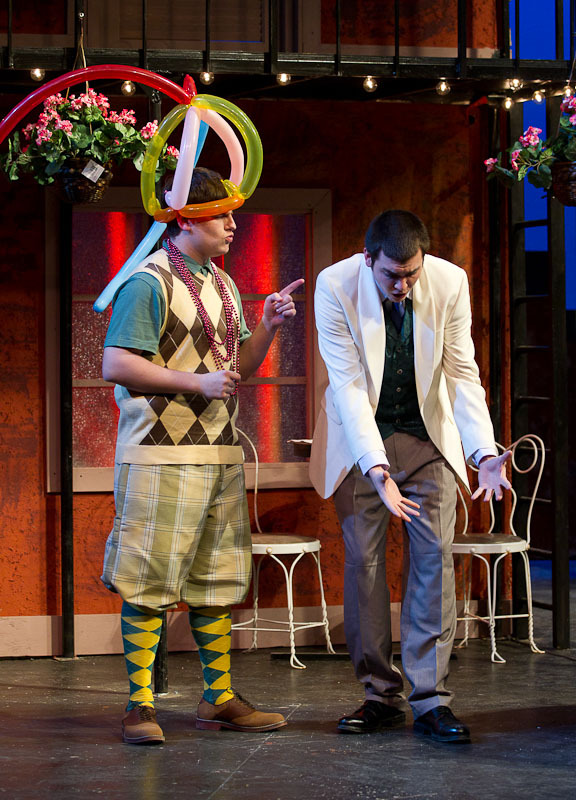 Show times for “The Comedy of Errors” are at 7:30 p.m. Friday and Saturday and 2 p.m. Sunday through Feb. 20. For tickets, call the Ethington box office at 639.8880. Wow Doug you were not joking! These sets are amazing!